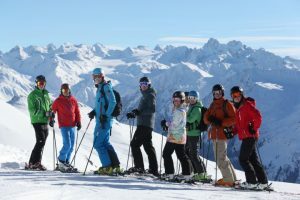 PT Ski take the hassle out of arranging corporate ski trips. With regular flights from London City, Heathrow and Gatwick and less than a 2 hour transfer from Zurich, it is just a short hop from your desk to the ski slopes! PT Ski can organize office off sites and work ski trips tailored to your requirements. An off piste guide can be booked for Friday and Saturday for those who want it. Those that don’t can ski with our rep who will ensure that everyone meets up for lunch. 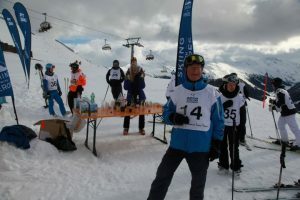 Other activities that can be arranged include team building races, night skiing, night skating, sledging, horse and sleigh ride to Alpine fondue restaurant, spa sessions and much more. Conference facilities can be arranged if required. Return home on the Sunday evening after nearly a full day’s skiing. 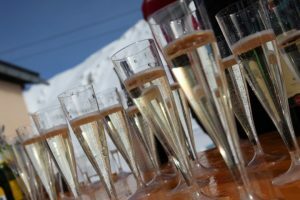 When you book your corporate trip with PT Ski you will receive comprehensive support from our London office from start to finish, while our dedicated in resort team will be on hand to look after your party while in Klosters. There are many accommodation options available, but as a guide prices for a 4 night stay in the Chesa Chalet bed and breakfast start from £570pp. This includes complimentary transfers from Zurich Airport, all local taxes and our PT Ski service; it does not include flights, ski passes or equipment hire. Similarly prices for a 4 night stay in the 4 star Hotel Piz Buin start from £795pp. Call us now on 02077365557 to discuss the perfect corporate trip.